Section headings and selected papers: Data Integration in Mineral Exploration by Statistical and Multivariate Techniques. Statistical pattern integration for mineral exploration, F P Agterberg et al. Intrinsic sample methodology, D Harris & Guocheng Pan. Man-machine analysis of geological maps, V V Marchenko & E A Nemirovsky. Methods and techniques of the prediction of metallic and nonmetallic raw materials using microcomputers in Czechoslovakia, C Schejbal & J Hruska. Data Integration in Mineral Exploration by Image Processing and other Techniques. Use of image processing and integrated analysis in exploration by Outokumpu Oy, Finland, J Aarnisalo. Mappable data integration techniques in mineral exploration, D Bonnefoy & A L Guillen. The use of digital elevation models computed from SPOT stereopairs for uranium exploration, P Leymarie et al. Applications in Petroleum Exploration. Conditional simulation in oil exploration, H Burger et al. 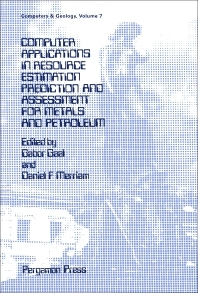 Computer-assisted estimation of discovery and production of crude oil from undiscovered accumulations, D J Forman & A L Hinde. Pore geometry evaluation by petrographic image analysis, S M Habesch. Inventories. Geological comparison of Brazil and China by state, J C Griffiths et al. Application of Q-analysis to the GLOBAL databank: a geological comparison of the USSR and the USA, D N Pilant et al. Explorational databases at the Geological Survey of Finland, B Saltikoff & T Tarvainen. Related Statistical Techniques. Regression analysis of geochemical data with observations below detection limit, Chang-Jo F Chung. Trend analysis on a personal computer: problems and solutions, J E Robinson. Index. For advanced students of geology, mineral economics, geomathematics and for courses in economic geology, exploration techniques, mathematical geology and resource analysis.